Found her on the 1900 Seneca, Ontario, New York census (dist 78 img 3) as Carrie Ketterer age 37. has given birth to 5 children, 3 are living. On this census the 3 children listed are Olga age 11, Alma age 10 and Raymond age 6. Found her on the 1920 Seneca, Ontario, New York census (dist 101 img 4) as Carrie L. Schriver age 58. Found her on the 1900 Fitzgerald, Irwin, Georgia census (dist 48 img 14) as Josephine Wilson age 31. Has given birth to 6 children, 6 are living. Found her on the 1910 Walla Walla, Walla Walla, Washington census (dist 250 img 23) as Josephine Wilson age 42. Found her on the 1920 Walla Walla Ward 2, Walla Walla, Washington census (dist 134 img 8) as Josephine Wilson age 51. Found her on the 1900 Union, Etowah, Alabama census (dist 163 img 7) as Martha J. Engle age 52. She is not listed with the family on the 1860 Saugerties, Ulster, New York census (img 14). Found his WWI draft registration card (1918). His nearest relative is Mrs. Beatrice Bergstrand. Found his family but not him on the 1920 Philadelphia Ward 15, Philadelphia, Pennsylvania census (dist 287 img 3). Found a Walter R. Bergstrand on the 1930 Hamden, New Haven, Connecticut census (dist 138 img 17) age 33, married to a Mary F., age 29. Found him on the 1930 Maiden, Catawba, North Carolina census (dist 22 img 31) as Lander Bumgarner age 7. Found him on the 1910 Monroe Ward 3, Union, North Carolina census (dist 130 img 5) as Francis L. Bundy age 4. Found him on the 1920 Monroe, Union, North Carolina census (dist 158 img 30) as Francis Bundy age 13. Found him on the 1930 Monroe, Union, North Carolina census (dist 22 img 14) as Francis L.Bundy age 24, manager, lumber business. He is single and living with his widowed mother. Found her on the 1880 Ironton, Lincoln, North Carolina census (dist 101 img 34) as Osia Camp age 8 months. Found her on the 1910 Ironton, Lincoln, North Carolina census (dist 69 img 3) as Osie F. Camp age 28, single, living with her widowed mother. Found her on the 1920 Lincolnton, Lincoln, North Carolina census (dist 108 img 21) as Ocie F. Camp age 39, single, living with her widowed mother. Arthur Decker, 77, a resident of Dover Plains and a former resident of Smithfield, died unexpectedly Thursday, November 16, at Sharon Hospital. He was a retired dairy farmer and gardener. Born in Millerton March 17, 1890, he was the son of the late Frank and Emma Jane Thorpe Decker. Mr. Decker had resided in Dover Plains only two months. He was a member of the Ancram International Order of Odd Fellows and the Smithfield Presbyterian Church. He also was a former Grange Member. Survivors include his wife, the former Ethel Sigler, a brother, Lourin Decker, Amenia, and several nieces and nephews. Funeral services were conducted Saturday, November 18, at the Peck and Peck Funeral Home, Pine Plains, with the Rev. Leif Ericson, pastor of the Smithfield Presbyterian Church, officiating. Burial was in Vedders Cemetery, Gallatin. Found him on the 1900 North East, Dutchess, New York census (dist 15 img 21) as Arthur Decker age 10. Found him on the 1910 Ancram, Columbia, New York census (dist 1 img 1) as Arthur Decker age 20. Farm laborer, working out. Found him on the 1920 North East, Dutchess, New York census (dist 26 img 17) as Arthur Decker age 29, farm laborer. Found her on the 1910 Saginaw Ward 20, Saginaw, Michigan census (dist 70 img 27) as Elizabeth Finger age 30. Found her on the 1920 Saginaw Ward 14, Saginaw, Michigan census as Anna E. Finger age 40. Father, mother born Germany. Found her on the 1930 Saginaw, Saginaw, Michigan census (dist 46 img 19) as Elizabeth Finger age 50. Found her on the 1900 Germantown, Columbia, New York census (dist 13 img 9) age 1. Found her on the 1910 Germantown, Columbia, New York census (dist 12 img 9) age 11. Found her on the 1920 Germantown, Columbia, New York census (dist 17 img 3) age 20, single, living at home. Found her on the 1940 Germantown, Columbia, New York census (dist 11-17 img 30) as Aletha Sipperly age 41. Found him on the 1900 Livingston, Columbia, New York census (dist 25 img 7) as Ross Finger age 15, farm labor. Found him on the 1920 Livingston, Columbia, New York census (dist 38 img 10) as Rossman Finger age 35, butcher, market. Found him on the 1930 Livingston, Columbia, New York census (dist 37 img 7) as Rossman Fingar age 45, farmer, fruit farm. He is living 2 dwellings away from his brother Frank Fingar. 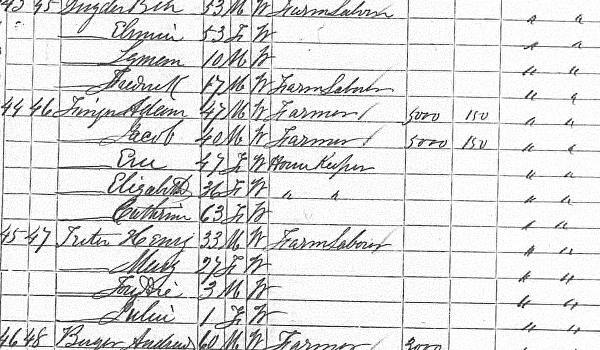 Found him on the 1940 Livingston, Columbia, New York census (dist 11-42 img 3) as Rossman Fingar age 55, farmer. He is living next to his brother Frank Fingar age 62. Found her on the 1900 Newton, Catawba, North Carolina census (dist 46 img 5) as Bertha M. Finger age 16. Found her on the 1920 Lincolnton, Lincoln, North Carolina census (dist 108 img 7) as Bertha Rudisill age 35. Found her on the 1930 Lincolnton, Lincoln, North Carolina census (dist 11 img 14) as Bertha Rudisill age 46. Found him on the 1910 Lincolnton, Lincoln, North Carolina census (dist 71 img 12) age 2. Found him on the 1920 Caldwell, Catawba, North Carolina census (dist 29 img 1) age 12. Found him on the 1930 Maiden, Catawba, North Carolina census (dist 22 img 33) as Loyd Finger age 21, cotton mill. His son Charles' obit lists his name as Floyd "Buss" Finger. In his mother's obit he is listed as William Adam Floyd Finger. His tombstone is marked "Floyd W."
Lee Fingar writes that Jacob's tombstone shows his death as Sept. 27, 1879 aged 56 years, 2 months, 25 days; which would place his birth as 2 July 1823. However the LDS extracted baptism record (IGI microfiche, page 17,501) shows his baptism date as 12 Aug 1821 which is more in harmony with his birth date as shown. He died in Sept, 1879 of Palsy - 1880 Gallatin, Columbia, New York mortality schedule. See him on the 1850 Gallatin, NY census as Jacob Finger age 26. See him on the 1870 Gallatin, Columbia, NY Census, age 40, living with brother Adam, and sisters Elisabeth, Eve, and Catharine. Found on the 1860 Gallatin, Columbia, New York census, household 886, age 29, living with brother Adam, and sisters Elisabeth, and Eve. Found him on the 1920 Maple Creek, Outagamie,Wisconsin census (dist 221 img 2) as Lyman Finger age 2 months. Found him on the 1930 Maple Creek, Outagamie, Wisconsin census (dist 43 img 19) as Lyman Finger age 10. Found him on the 1920 Waterloo Ward 2, Black Hawk, Iowa census (dist 20 img 14) as Otto A. Finger age 1 year 8 months. Found him on the 1930 Brazeau, Perry, Missouri census (dist 8 img 20) as Otto A. Finger age 12. Found her on the 1920 Bois Bruole, Perry, Missouri census (dist 60 img 18) as Willie H. Finger age 17. Found her on the 1930 St. Louis, St. Louis, Missouri census as Hazel Finger age 28, single, living with her widowed mother. Found her on the 1940 St. Louis, St. Louis, Missouri census as Hazel Finger age 37, single, domestic. She is living in the boarding house of Charlotte B. Huckins age 50, widow, lodging house keeper. Found him on the 1920 Waterville, Lucas, Ohio census (dist 170 img 7) age 67, widower. Found her on the 1850 (not stated), Iredell, North Carolina census (img 59) as Harriet Fry age 5 months. Found her on the 1860 Division 37, Haywood, North Carolina census (img 133) as Harriet M. Fry age 13. Found her on the 1880 Newton, Catawba, North Carolina census (dist 47 img 36) as Harriet Keener age 30. Found her on the 1900 Crab Orchard, Catawba, North Carolina census (dist 45 img 10) as Harriet M. Keener age 54, born July 1845. Found her on the 1920 Newton, Catawba, North Carolina census (dist 44 img 20) as Harriet Keener age 73. Found her on the 1930 Maiden, Catawba, North Carolina census (dist 22 img 31) as Harriet M. Keener age 83. Her death certificate shows her birth as 14 Jul 1846. Found her on the 1850 Benton, Yates, New York census (img 81) as Harriet Rector age 26. Found her on the 1860 Benton, Yates, New York census (img 55) as Harriet Rector age 39. Found her on the 1870 Benton, Yates, New York census (img 20) as Harriet Rector age 49. Found her on the 1880 Potter, Yates, New York census (dist 222 img 15) as Harriet Rector age 56. Found her on the 1910 South Orange, Essex, New Jersey census (dist 218 img 39) age 3. Found her on the 1940 Esopus, Ulster, New York census (dist 56-2 img 37) as Katherine D. Ellsworth age 33. Winfield L. Myers, well known resident of this city, died suddenly yesterday morning at his home, 733 Union street. Mr. Myers was a foreman with the New York State Highway Department. He was the son of the late Marshall M. and Martha Lasher Myers, of Taghkanlc. He was a member of the Claverack Dutch Arms and of the Claverack Grange. He Is survived by his wife, Mrs. Ida Link Myers. Found her on the 1880 Saugerties, Ulster, New York census (dist 153 img 49) as Eva Pareis age 21, single, living at home. Under the column 'Health' is written consumption. Found her on the 1880 Red Hook, Dutchess, New York census (dist 63 img 9) age 11. Found him on the 1900 Elm, Pratt, Kansas census (dist 176 img 6) age 41, grocery & dry goods. Found her on the ship's list Gustave, that arrived in Baltimore from Beckum on 19 Oct 1836. Found her on the 1860 New York Ward 20, New York, New York census (dist 3 img 124) as Mary Finger age 40. Apparent marriage record from Sankt Stephen Katholisch, Beckum Stadt, gives her age as 21 in 1831. Possibly connected to wrong parents. Should be Samuel and Hannah, not Benjamin and Sarah. Found him on the 1850 Robeson, Berks, Pennsylvania census (img 23) as Rolland Smith age 14. Found him on the 1860 Robeson, Berks, Pennsylvania census (img 7) as Roland Smith age 24, single, living at home. Found him on the 1870 Robeson, Berks, Pennsylvania census (img 7) age 34, married, nailer. Found him on the 1880 Robeson, Berks, Pennsylvania census (dist 62 img 9) age 44, married w/ 7 children. He is living next to his parents, Samuel and Hannah Smith. Found him on the 1910 Princeton, Mercer, New Jersey census (dist 42 img 20) as William Task age 45, retail merchant. Found him on the 1920 Princeton, Mercer, New Jersey census (dist 45 img 14) as William Task age 56. Found her on the 1940 Benton, Yates, New York census (dist 62-10 img 7) as Lola J. Tears age 9. Found him on the 1870 Saugerties, Ulster, New York census as Alex Whitney age 42, house carpenter. Found him on the 1880 Saugerties, Ulster, New York census (dist 29 img 153) as Alex C. Whitney age 50, carpenter. Found her on the 1900 Berne, Albany, New York census (dist 70 img 14) as Edith Becker age 37. Has given birth to 6 children, 5 are living. Father, mother born New York. Found her on the 1910 Berne, Albany, New York census (dist 100 img 11) as Edith Becker age 47. Has given birth to 6 children, 4 are living.